Item as described, free shipping, arrived fast too. Used it today! Thank you! Good value, SUPER fast shipping. I wear glasses and these work great. I'm using them now to look across a field. These will replace my opera glasses. I have heard criticism about these when you wear glasses. But I have had zero issues. I am usually in a dark room, or at least out of the direct sunlight when I use them. That said, it is possible they may present a problem if light shines in between your eyes and your glasses. But I'm only speculating why some have found issues with these great binoculars. Not what you think they might be! These binoculars do not have any focus wheel adjustment! They are only good for people who have perfect 20/20 vision. They come pre focused for 35 ft. to infinity only for people with that perfect vision. Other wise if you do not have it the objects will appear closer but they will not be in focus at all. I am one of those people without perfect vision so to me they are useless. I wish I knew that they would be like that before I purchased them. They are not like all of the other binoculars out there that can be focused thru the adjustment wheel that all other binoculars have. Buyer beware these are not what you think they might be or are sold as.. Hope you heed the warning! Handy for the car or a game. Not for extended viewing. These are almost perfect to keep handy in the car to peep out street signs and traffic conditions, or to watch highlights of a game from the cheap seats. The large exit pupil and wide field of view make for quick acquisition of the image, and since there is no need (or ability) to focus, you won't waste any time there. The focus is set for a person with normal vision, so if you need new glasses, these will magnify the deficiencies of your old prescription. The focus is not as sharp as a good pair of fully adjustable binoculars, and extended viewing will probably result in eyestrain. There is some distortion at the outer edges of the field, but you can't really focus your eyes at the outer edges of your own field of view either. 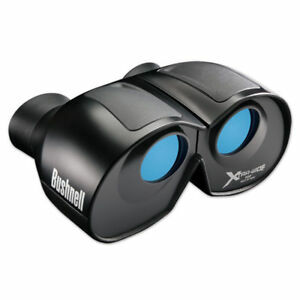 The extra wide field really shines at quickly picking up motion or landmarks to orient your view when compared with normal binoculars. The large (6mm) exit pupil and low (4x) power give very good twilight performance that is actually almost equal to my 40mm, 8x Nikon birding optics. No contest in overall image quality or magnification of course, but pretty good dim light performance never the less.